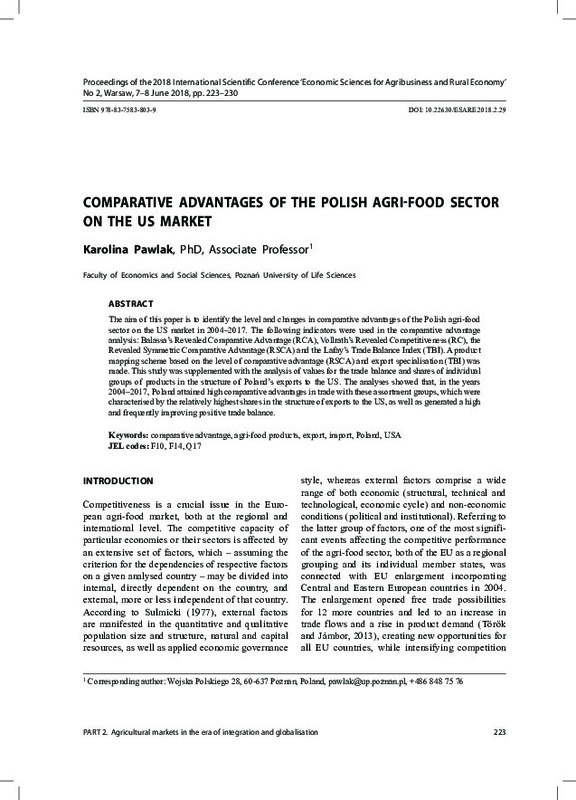 The aim of this paper is to identify the level and changes in comparative advantages of the Polish agri-food sector on the US market in 2004–2017. The following indicators were used in the comparative advantage analysis: Balassa’s Revealed Comparative Advantage (RCA), Vollrath’s Revealed Competitiveness (RC), the Revealed Symmetric Comparative Advantage (RSCA) and the Lafay’s Trade Balance Index (TBI). A product mapping scheme based on the level of comparative advantage (RSCA) and export specialisation (TBI) was made. This study was supplemented with the analysis of values for the trade balance and shares of individual groups of products in the structure of Poland’s exports to the US. The analyses showed that, in the years 2004–2017, Poland attained high comparative advantages in trade with these assortment groups, which were characterised by the relatively highest shares in the structure of exports to the US, as well as generated a high and frequently improving positive trade balance.